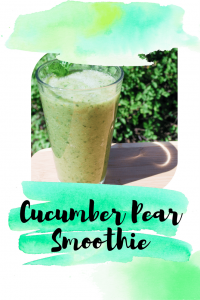 This refreshing cucumber pear smoothie is a perfect way to get hydrated on (or after) St. Patrick’s Day. Full of fiber and electrolytes, this beverage is the perfect way to balance any celebration shenanigans. Roughly chop the cucumber and pear. 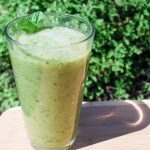 Add all the contents to the blender, except the ice, and pulse until smooth. Add the ice, and blend until the ice is in fine pieces.